Few cars better capture the spirit of Jalopnik better than the Mazda MX-5 Miata. What do you need to know before you buy a Mazda Miata? Don’t worry, we’ll tell you everything right here in the Ultimate Buyer’s Guide. The Mazda MX-5 Miata is the very definition of a “fun car.” Look it up in the dictionary. We’ll wait. You said your dictionary doesn’t have compound words? You should get a new one. Also, you should get a Miata. 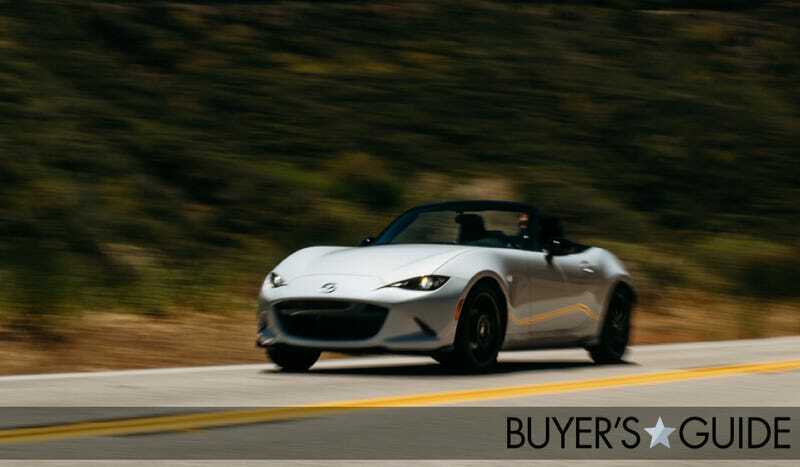 This ND Miata – the ND stands for fourth generation – is made from the same excellent ingredients that made the first generation NA such a great driver’s car when it launched for the 1989 model year: It’s small, nimble, convertible, inexpensive, and actually fuel efficient. It’s such a superb driver’s car on so many levels, it’s hard for us not to gush over it each time we mention it. The Miata is totally new for the 2016 model year. And it’s gotten much better. The ND MX-5 gets sharp new styling, a more efficient engine, an entirely new architecture, and a pleasant new interior. The ND Miata weighs nearly 200 lbs less than its NC predecessor and is also slightly shorter overall. It’s not quite as powerful as the outgoing car (155 hp vs 167 hp), but it has about the same amount of torque and the improvements in weight and aerodynamics make it actually feel quicker. After having driven it, we think the new 2016 MX-5 is a triumph. The Miata isn’t about power. It’s meant to be fun in the curves and decent on fuel. Acceleration, while not terrible, has never been the little roadster’s strong suit. And like all MX-5 Miatas before, the new car comes with a small displacement four cylinder engine that produces only a modest amount of power. The ‘16 car’s 2.0L SkyActive engine cranks out 155 horsepower, more than enough power to scoot the featherweight 2,400 lb convertible down the road briskly. The engine comes mated to either a 6-speed manual or 6-speed automatic. Like Miata’s of yore, the ND excels when it comes to fuel economy. And that’s the beauty of the car. It’s one of few vehicle that can offer such high levels of driving pleasure, all the while keeping your gas tank full. The automatic scores an impressive 36 mpg on the highway. The new Miata comes in three flavors: Sport, Club and Grand Touring. All trim levels come with the same 155 hp 2.0L inline four, 11 inch front and rear rotors (vented up front), electric power steering, double wishbone front suspension, multilink rear suspension, and monotube shocks. Sport: Base model. Starts at $25,735. Notable standard features: 6-speed manual transmission, 16 inch aluminum wheels, LED headlights, air conditioning, cloth seats, power windows, power locks, 6-speaker audio system with CD player, Bluetooth capability, dual front and side airbags. Club: Performance oriented model. Starts at $29,420. Notable standard features over Sport: 17 inch aluminum wheels, 9-speaker Bose audio system, front air dam, rear spoiler, sporty Bilstein shocks, limited slip differential, shock tower brace, in-car communications system with 7 inch touchscreen. Grand Touring: Luxury oriented trim. Starts at $30,885. Notable standard features over the Club: Leather trimmed heated seats, unique 17 inch wheels, automatic climate control, rain-sensing wipers, navigation, blind spot monitoring, adaptive front lighting, lane departure warning. No Bilstein shocks or limited slip differential. In keeping with Jalopnik tradition, we recommend the less expensive, performance-oriented models. That means Sport or Club. Our man Andrew Collins has weighed in on this, and he thinks a bare-bones Sport model offers tons of value. But if you want to maximize your vehicle’s track capabilities right out of the box, the Club, with its new shocks and limited slip differential, might be the better option.